Ceviche (also known as seviche and cebiche) is a dish made by marinating fish and/or seafood in an acidic liquid which “denatures” the protein. 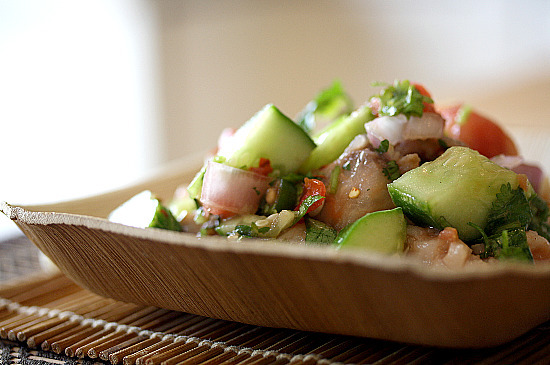 Because you are able to “cook” the fish without any heat, ceviche is a great meal to make in the summer. You can make ceviche with any firm white fleshed fish or seafood…you’ll want to use very fresh fish, and it’s best to use fish that is low in mercury and sustainably harvested whenever possible. I’ve used swordfish here because I developed this recipe for a swordfish contest over at food52, but next time I make it (which will definitely be soon), I plan to use one of the more sustainably harvested fish/seafood such as halibut, tuna, scallops, shrimp, or squid. I might also try it with wild salmon. Ceviche almost always features Latin American flavors, but here I changed things up a bit by adding a few Asian ingredients…feel free to leave out the rice vinegar, fish sauce, brown sugar and red pepper flakes if you prefer a more classic ceviche. Serve on its own as a light meal or snack, enjoy over cooked brown rice, quinoa, or amaranth, or eat with all natural chips. 2. When fish turns white/opaque, drain off and discard the marinade. 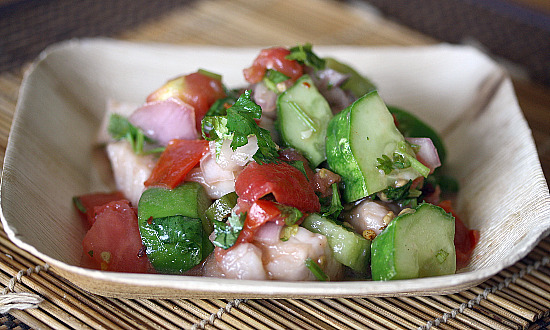 Combine the fish with the tomato, cucumber, shallot, chile pepper, cilantro and olive oil in a medium bowl. 3. Whisk rice vinegar with fish sauce and brown sugar and pour over the fish. Add a pinch or two of red pepper flakes. Mix well and chill for 1-2 more hours before serving, garnished with a bit more red pepper flakes, if desired. First, it is with a great deal of guilt that I eat swordfish but really love it. I never thought of it as a ceviche fish though…usually stick to shellfish. I cannot wait to try this with the heatwave we’re having in NYC. How did you do with food52? This looks great. That looks great. I love ceviche. I love the Asian Twist. I am a big fan of ceviche during the summer months…I love dipping into a bowl with some freshly made tortilla chips. Swordfish is so good…I only wish it was a more sustainable choice. 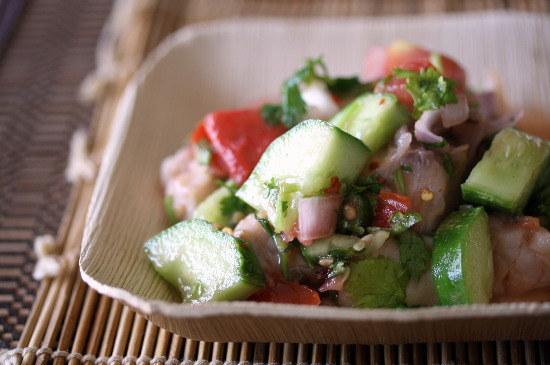 Wonderful ceviche recipe! I cannot think of something more refreshing and cooling on a hot day than a plate of this pretty dish. Oh wow – if only I saw this before I went shopping today! Next week for sure. This looks very good and easy to make. I will certainly try it. Hey Winnie, this ceviche looks light and delicious.